Born in Dublin in 1936, he studied at the National College of Art & Design in Dublin and St. Martin’s School of Art in London. He represented Ireland at the Paris Biennale and the Lugano Exhibition of Graphics, both in 1965. He won the Arts Council portrait competition in 1965, the Munster and Leinster Bank competition in 1966, and first prize in the Irish Exhibition of Living Art competition in 1967. In 1985, he was named Sunday Independent Artist of the Year, and he received the O’Malley Award from the Irish-American Cultural Institute in 1993. He is also known for his series of mocking self-portraits comparing the artist to Don Quixote. 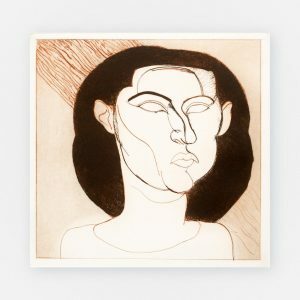 His work has been exhibited across Ireland, in Switzerland, England and the U.S. Solo exhibitions include the Dawson Gallery, Dublin (1965, 66, 68, 71, 75) and Taylor Galleries, Dublin (1978, 81, 83, 85, 91, 92, 93, 94, 96, 97). In 1991, he was artist-in-residence at the Gate Theatre’s Beckett Festival in Dublin, with accompanying works appearing at the Douglas Hyde Gallery. He is a member of Aosdána. In 2001, a large exhibition of his portraits of women, centred around portraits of his son’s adopted daughter, appeared at the Dyehouse Gallery in Waterford. He lives in Co. Galway.